Alupar is a holding in the energy sector, dedicated to the segments of transmission and generation, focusing in the development and investment in infrastructure projects related to the energy sector in Brazil and other countries in Latin America. The company is the largest 100% private company and one of the biggest among all companies from the segment. 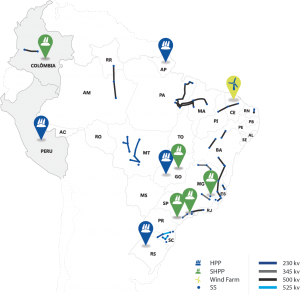 On the transmission segment, Alupar has the concession of 29 transmission systems, totaling 7,736 km of transmission lines, through concessions with a term of 30 years, located in Brazil and one lifetime in Colombia. As well active in the generation segment, Alupar holds the concession / authorization of 10 assets, totaling 687.0 MW of installed capacity, with 580.0 MW due to four small hydropower plants, three hydropower plants and one wind power plant in operation. The 107.0 MW under construction refers to projects of hydropower generation. The technical competence of Alupar contributes to develop transmission and generation projects with efficiency and quality, from its conception to its effective operation. Alupar has being demonstrating efficiency and quality which may be evidenced by the high quality performance indexes in its operational undertakings. Despite of the confirmed competence in Brazil, Alupar is well positioned to act in other countries of the Latin America, it is present in Colombia through Risaralda Energia and Transmisora Colombiana de Energia S.A.S. and in Peru through La Virgen. Committed to create value for shareholders and society, Alupar has a great expertise, strong financial discipline and social responsibility to continue its sustainable growth through the development of generation projects and transmission systems. To consolidate and perpetuate the company among the most efficient, profitable and respected in the energy sector, basing its action on corporate responsibility, social and environmental, using the corporate governance mechanisms and enhancing its customers and employees. To be the leader in performance in the energy sector by 2020, with a growing presence in international markets.